A paper clip or a small piece of wire to use as a jumper. A friend of mine was having trouble with one of his computers. At first, it sounded like a power supply problem, so I gave him some advice on testing the power supply. A power supply can make or break your computer. It's often one of the first components to fail because of the high temperatures and abundance of electrolytic capacitors. Heat and capacitors aren't usually a good combo, and running the computer with a clogged fan can raise temperatures in the PS high enough to damage the caps. A power supply may also take the brunt of the damage in a power surge, as well -- especially if the computer is turned off. There are a few things to understand about the ATX Power Supply. First off, ATX power supplies are soft-triggered, meaning that they're always pulling a little bit of electricity from the wall. They're powered on not with a hard physical switch, but with an electronic relay activated by the motherboard. Therefore, a little bit of electricity has to be going to the motherboard even when the computer is off, so that it can tell when you have hit the power switch. Before we begin testing, unplug the computer from the wall outlet, open the case, and unplug all the Power Supply cords from the motherboard, drives and all accessories. Notice that there are many black wires on the main ATX plug. If you have a DMM with an ohm-meter or continuity tester, you should check to make sure all of the black wires have continuity. 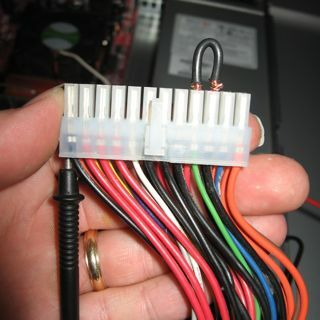 These are all chassis ground wires, and you can use any one of them to test the for the power supply. 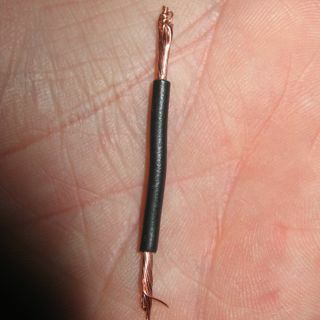 Hook one test lead up to any black wire, then make sure that there is little to no resistance between that black wire and all the other black ones. 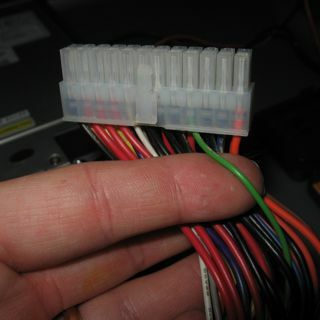 Be sure to check the grounds on the P4 plug and Molex (hard drive) plugs. Test the voltage between this purple wire and ground. This is the "standby" power, and should be near 5VDC. If this doesn't register any voltage, there may be a fuse blown internally to the power supply, or it could be something more catastrophic. 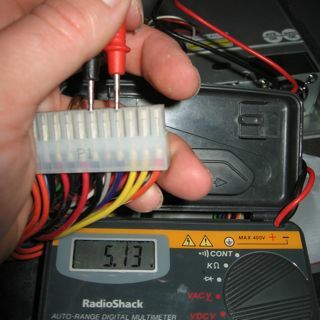 If the voltage is wildly out of spec (like 2.3VDC or 8VDC), something is very wrong. Trash it and replace your power supply. Now, you'll need your paper clip or a jumper wire. I chose a jumper wire because it's insulated and I didn't want to run the risk of hitting the jumper with my DMM's test probes. I'm just careful. Find the green wire. This is the power-on wire. 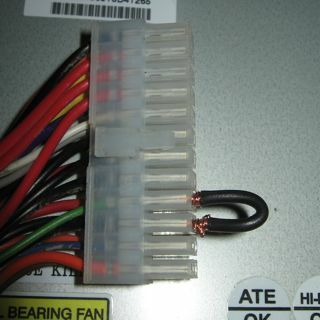 When the green wire is jumpered to ground, the power supply fan should spin up. If this doesn't happen, something is wrong, but it could just be a clogged fan so you should at least check the voltages before you go shopping for a new power supply. Make SURE you jumper the green wire to a black wire, not the purple one. I don't know if it would hurt anything, but the PowerON wire is not designed to be hooked to anything other than ground. 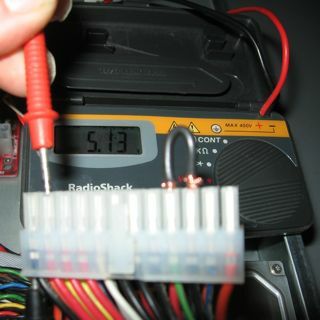 First, I tested the voltage of all of the red leads. These should be +5VDC. Not surprisingly, they are the same voltage as I saw on the Standby Power rail which should also be +5VDC. 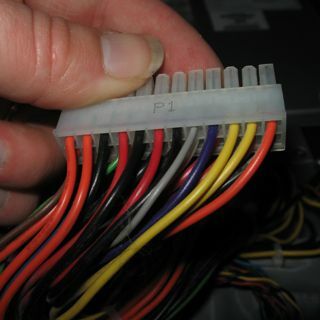 To be sure the power supply is intact, check ALL of the red, yellow, blue and orange wires on ALL plugs, even for the P4 and Molex hard drive power plugs. A single broken or damaged connection can be the difference between a healthy computer and one that's unstable or may not even boot. Test all of the leads except for the brown, green, and gray ones. The green is obviously in use and working at this point. Brown and gray are both voltage sense connections that you don't need to bother with. 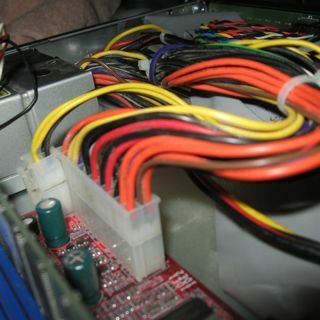 Your power supply may or may not have a white wire. It's optional in the ATX specification but most new power supplies have them present. Use the table below to determine the voltage specifications for each color. 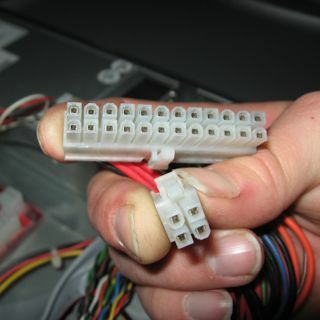 Note that these are voltages as related to chassis ground (black wires). Again, if any of these voltages are wildly out of spec or you notice an open circuit (0 volts), you should probably replace the Power Supply or have it looked at by a competent computer repair professional. Opening up a Power Supply voids its warranty and exposes components that could probably hurt you even if it's unplugged.